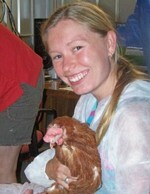 Dr Lauren Edwards undertook her PhD, titled Human-animal interactions in the laying hen, with support from the first round Australian Poultry CRC (2003-2009) under the supervision of Professors Paul Hemsworth and Grahame Coleman. Now employed as a lecturer in Applied Animal Behaviour and Welfare at Unitec Institute of Technology in New Zealand, Lauren’s research results suggest that the human-animal relationship is very important for laying hens, particularly with regard to welfare and performance. It has long been established that poultry are innately fearful of humans, and that farm animals experiencing fear in the presence of stockpeople suffer from reduced welfare and productivity due to repeated exposure to this stressor. Lauren has researched human-animal relationships in commercial cage-layer facilities both here in Australia and in the USA. Her research has focussed on relationships between hen avoidance behaviour and duration/proximity of human workers to cages, the behaviour and attitude of stockpersons and flock productivity. Non-invasive albumen corticosterone levels have been recorded as a measure of stress in hens. Lauren found that hens displayed greater avoidance behaviour in laying houses where the stockpeople made more noise, and less avoidance behaviour in laying houses where stockpeople spent more time standing stationary in front of the cages. Her research results have consistently suggested that close proximity of visual human contact is effective in reducing the behavioural response of hens to human contact. Interestingly, the duration of human contact was found not to be a significant factor.